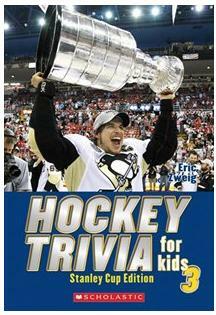 Hockey Trivia for Kids 3: Stanley Cup Edition is the ultimate hockey trivia collection - all about our beloved Cup! How many Stanley Cups are there? Why does the Cup always seem to end up in Mario Lemieux''s pool? What are some of the strangest things that have sat in the Cup bowl? This book answers all of these questions and more - all about our beloved Stanley Cup! Kids can continue to wow their friends with their amazing hockey knowledge. Chock full of amazing facts delivered in the same style as the previous Hockey Trivia books, this book is a flat-out winner! About The Author: Eric Zweig''s love of sports and compiling facts about them started early: by the age of ten, he was already filling school notebooks with game reports and statistics. Eric has also worked as a writer and producer for CBC Radio Sports and TSN SportsRadio. He lives in Owen Sound, Ontario, with his wife Barbara. Hi, I found a mistake on page 36 under 2005-2006 Montreal Canadians Eric Staal. Eric Staal did not play for the Montreal Canadians. He played for the Carolina hurricanes.